ALL WE NEED’S A GUITAR, OUR LOVE AND A LANTERN. 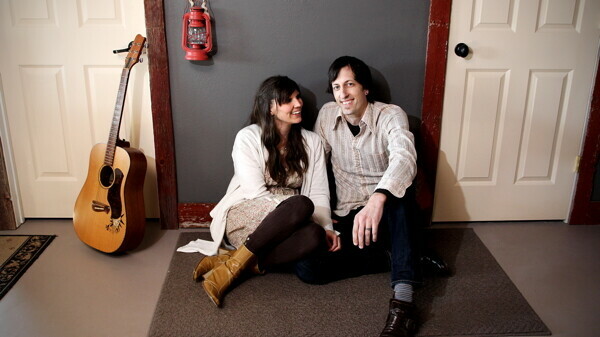 Matt and Suzie Kendziera of honeytree. Country + Folk + Jazz = “Cofoja” … a perfect description of the musical style portrayed by honey Tree on their album bluebird. Matt and Suzie Kendziera, the founders and members of honey Tree, (although musical roles are filled by friends as needed) have been creating music together for the 15 years they’ve been married and since first meeting as students in the music department at UW-Eau Claire. Since then they have become local favorites performing in churches, several bands, Christmas variety shows, and more. They’re most recent project, bluebird by honey Tree, is the product of fed-up Wisconsin winter boredom two years ago and a need for creative thought. “One winter we were just so moved and inspired because winters get so long and we were like ‘let’s just be done’… let’s shut off the TV and just get creative and write music and write about the spring,” Suzie says. Enthused, every evening after putting their kids to bed the couple headed for the den in their country home to sip on wine and just make music together. Matt says it was the first musical thing they truly did for fun together in a while and that the process was “good for their souls.” The mood set by the album is undeniably serene and peaceful. This ties in with Matt and Suzie’s desire to make listeners come together and feel love and laughter when hearing their music. When talking with Matt and Suzie, you can’t help but feel inspired and uplifted; their passion and love for life and music is really something to be experienced. Suzie describes their musical style as “cofoja” (co –fo –jay), taking inspiration from artists such as Sara Bareilles and Damien Rice and all other parts of their life such as jazz and theater. “It fits what we like to listen to right now,” Matt says. “There’s very little music that one of us at one point in our lives didn’t like ... so at some point those influences just come in from both sides.” And, as Suzie adds, “You find your own voice.” Suzie is from Janesville and Matt is from Boscobel, so the two are at heart Midwesterners who love Wisconsin, and they want their music to reflect that. The duo recently scored the stage of Fanny Hill Dinner Theatre to put on Wayside this summer and fall. Wayside is a call to what we now call rest stops and the couple’s experiences during family road trips as kids. They hope to focus on one small Wisconsin town per production and highlight the town’s strange facts and famous figures while including musical performances and audience participation. Suzie says, “Wayside is a combination, new spin, on old public radio shows with a down-home feel … and heartwarming laughter and joy about Wisconsin” adding the engaging element of a variety show. Since the variety show won’t be up and running for a few months, you can get your honey Tree fix at their first performance at 7:30pm Friday, May 10, at B-Side Community, 405 N. Farwell St. Also, be sure to keep updated on their shows and performances at honeytreeband.com.